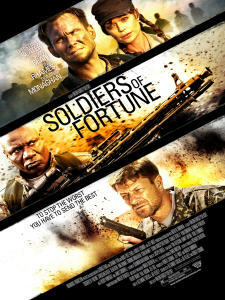 Movie Review: «Soldiers of Fortune». Robert Crombie happened to be a director filming actor Christian Slater in the drama Shadows of the White Nights (2010) and Joe Kelbley has got his big screen debut with the new motion picture. Usually such titles as the one covered by this Review are released directly to DVD or to Video on Demand (VOD), which is a great income source for low-budget projects, especially in Europe or the U.S. 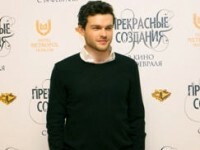 Still Soldiers of Fortune managed to get wide screenings in Russia, and the film is due to limited ones in the North America, starting on the 3rd of August, 2012, though the first presentation was held in Kuwait in early June. Later on in Europe the movie will keep up its way already on DVDs. These three scriptwriters could not invent anything original, while working with a familiar track following the life steps of a retired mercenary, trying to diversify the old idea with merely a few ​twists. Moreover, many fans of genre are aware of the Soldier of Fortune, Inc. (1997-1999) TV series, featuring a group of retired military personnel carrying out secret U.S. government tasks. That military soap opera was far less trivial than this story about another Civil War in place. It is unfolding on the really existing Snake Island in the Black Sea, which is currently owned by Ukraine, what explains all the close Crimean entourage. Previous works of the director Maxim Korostyshevsky included several domestic releases such as Igra v Modern (2003) or Dura (2005), both also casting his wife Oksana. The protagonist of the Soldiers of Fortune plot is the ex-military officer Craig Mackenzie, who was fired from the army for disobeying orders, when he tried to save the life of his mate on a dangerous mission in Afghanistan. Now the character of Christian Slater alongside his own friend Reed performed by Freddy Rodriguez hardly manage to find money for living. Craig plays cards and drinks heavily, while Reed is losing property, because of loans he can’t pay back. In general, many actors were brought here by the chance to reach the big screen one more time and to avoid any possible breaks in their film or TV careers. Mainly, the movie casts known B-movie western celebrities with some of them appearing in A-list titles from time to time holding second plan roles or cameos. According to American producers speaking at the Moscow Business Square film forum in last June, when this part of the 34th Moscow International Film Festival took place, now many Hollywood actors are looking for constant employment. Major studios have reduced the number of planned projects, and smaller filmmakers got a chance to arrange stars’ appearances in their titles, what could seem impossible a few years ago, when they might ask for a fee comparable with a whole budget of the motion picture. Even Craig Mackenzie here rushes for his chance and agrees to the proposal of the mysterious Cecelia presented by Oksana Korostyshevskaya, who enlists him as a mercenary warrior. Cecelia with her brother Ernesto played by Ryan Donowho are heading the resistance on the Snake Island in the Soldiers of Fortune film. Their feud goes to the local dictator Colonel Lupo brought by Gennadi Vengerov. He is aided by one retired CIA officer Mason. Irishman Colm Meaney, who in 2012 also appeared in the Bel Ami (2012) drama depicts a grotesque type of a villain, comparable to his Daumer role in the Under Siege (1992) action flick, though this time residing higher in the ranks hierarchy. Colm Meaney and Sean Bean show the best performance here, while Christian Slater and Ving Rhames good talents were simply buried in the background, because of a poor script. Craig has to become a war guide for a group of rich tycoons decided to take on this exotic tour throughout an armed conflict zone. 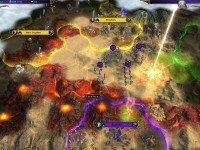 Sly rebels use these people and their money to arrange an arms delivery deal disguised as a training trip for those, who are tired from most usual pleasures. Among the guests you could see the influential Wall Street banker with a weird name Vanderber, industrialist Roman St. John, director of telecom business Sam Haussman, arms dealer Grimaud and even video game designer Tommy Sin. Read on further to learn about filming and the soundtrack of Soldiers of Fortune.